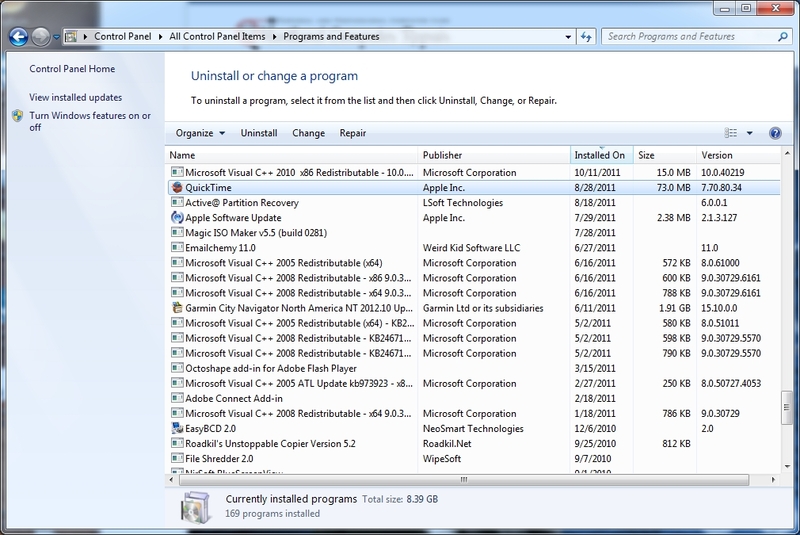 Apple Quicktime, which gets installed automatically when you install Apple iTunes, should be uninstalled from your Windows computer immediately. Apple has abandoned Quicktime on the Windows platform and so they are no longer releasing security updates for it. Quicktime represents both a theoretical risk to the security of your computer and an actual one now as specific exploits for the unsupported program have been identified. The reason that this programs now represents a serious security risk is that bad guys know what the vulnerabilities of Quicktime are and can serve them up to you from, say adverts on legitimate websites or from infected and malicious websites. You would not need to actually download or install a program, you could be infected by malicious code sent to the Quicktime plugin already on your computer. Since Quicktime bugs and security holes are no longer being fixed by Apple, miscreants can create viruses or exploits that they know will work and will never be patched. This makes creating and selling the exploits very cost-effective for them. If you have just about any Apple software on your computer, Apple has likely slipped Quicktime in there as well so even if you’re not sure you have it, you should probably check. If you need help uninstalling Quicktime, look here for instructions. According to Trend Microsystems, their product has protected users from this exploit since last year and I suspect most other decent antiviruses do as well but for every known exploit for this software, there could also be many other as yet undiscovered ones so there is considerable and unnecessary risk in depending on your antivirus. If your small business needs help with computer security, take a look at Hartland Computer’s Two Hour Security Review service for an inexpensive way to keep your IT environment safe.